Some of the nicest campgrounds don’t have hook ups and watching your grey water becomes an issue. Here are some ideas on making an outdoor shower stall. Thought it was worth posting again for those new to my blog. We have only had our travel trailer for one camping season but have quickly realized that gray water is one of the biggest challenges, especially when dry camping. We didn’t experience this problem in our tent trailer because we didn’t have hot water nor a holding tank. Now that we have both, I like the idea of showering at my site but with 2 teenagers and no hookups the gray water will fill up quickly. 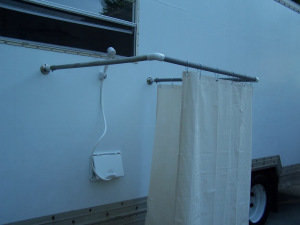 The solution: an outdoor shower stall at the back of the trailer. The problem: finding a way to make it private. I headed out to research this and here are my findings. 2 boat station mounts are screwed to the exterior wall, which allows pipe and shower curtain to be attached to it creating a quick and easy outdoor shower.